June 29, 2010 -At 07:34 Stations 1 & 2 were dispatched to the intersection of Garfield Avenue and Lilly Street in the borough for a motorcycle accident with unknown injuries. 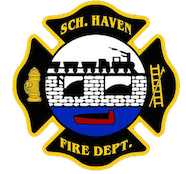 Schuylkill Haven PD was the first to arrive on scene and advised county that no fire was needed. All units canceled the call. June 23, 2010- At 12:02 Stations 1 & 2 along with District 41 (Cressona) were dispatched to the area of 1510 Route 61 South (Aldi’s Supermarket) for fluid leaking onto the roadway. Crews arrived on scene and applied floor dry to absorb the fluid. Chief 723 (Donatti) had command and all units were cleared after 20 minutes. June 23, 2010 – At 10:41 Stations 1, 2 & 4 along with Distrcit 41 (Cressona) were dispatched to 1540 Route 61 South at the Cressona Mall, for a vehicle accident with minor injuries. When Chief 722 (Sattizahn) arrived on scene he was met with a two vehicle accident with minor injuries and fluids down. Crews applied floor dry and swept debris from the roadway. Time out was about 1 hour until PSP and the tow company arrived. June 22, 2010 – At 23:27 Stations 1, 2 & 4 were dispatched to the rear of 3 Grace Avenue, North Manheim Township (behind Renninger’s Market) for a reported brush fire. Chief 723 (Donatti) arrived on scene and was met with a small area of debris burning behind the residence. Crews used tools and a 1 3/4″ trash line to put out the fire. Time out was about 15 minutes. June 21, 2010 – At 08:50 Stations 1 & 2 were dispatched to the area of 500 Route 61 South for a possible fluid spill on the roadway. Crews arrived on scene and were met with a small area of oil that had leaked onto the roadway. R726 and U734 applied floor absorbent to the area and were placed available by Chief 723. June 18, 2010 – At 07:38 Station 2 was dispatched to 1 Orchard Street Pine Grove Borough to the HH&L Fire Company for a move up assignment as both Pine Grove Stations were out on a structure fire. As E-733 became en-route Pine Grove command advised they could cancel the call. June 16, 2010 -At 14:30 Stations 1 & 2 were dispatched to the area of Route 61 and Spring Street for a motor vehicle accident with injuries. Chief 722 (Sattizahn) arrived on scene and advised no apparatus was needed and canceled all units. June 13, 2010 – At 7:31 Station 1 was dispatched for Ladder 725 along with District 41 (Cressona) to 7 Marsha Drive for an automatic fire alarm. Crews arrived on scene and determined a false activation and all units were placed available. Chief 735 (Kremer) responded with Ladder 725.